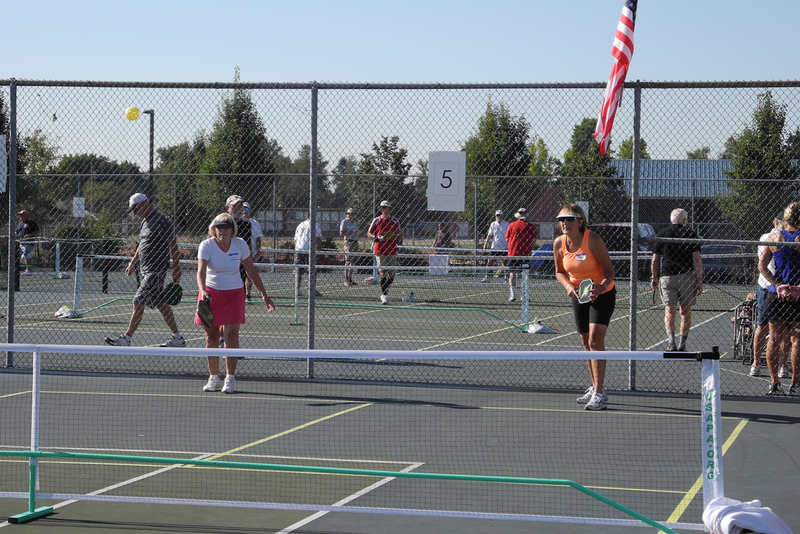 Welcome to Albany Pickleball, home of the Albany Pickleball Club and the Rally In The Valley Pickleball Tournament. We incorporated as an Oregon non-profit club on September 12, 2012. 2019 Rally In The Valley Pickleball Tournament. Our 7th Annual Pickleball Tournament with Men’s, Women’s and Mixed Doubles in both skills and Senior levels! Mission Statement: The mission of the Albany Pickleball Club is to organize the play of Pickleball in Albany, OR and the surrounding Mid-Willamette Valley for the enjoyment, fellowship and promotion of the sport of Pickleball. See our Albany Pickleball Club Bylaws. PLEASE SIGN UP IN ADVANCE ON OUR DOODLE BOARD! The Doodle Calendar contains our schedule of play for each week. Signing up for scheduled days allows out of town people to know whether there will be enough players to warrant the trip. Check the Doodle links below for dates, times and places. You can get weekly emails and updates by providing your email to albanypickleball (at) gmail.com. — Play at The Hackleman Pickleball Courts is generally June after school lets out till October rains. During shoulder season there will be play at Hackleman on nicer days. — Play at the Albany Boys & Girls Club through the winter. G3 Athletic Club – G3 Athletic Club: 5520 Oregon Hwy 99W, Corvallis (near Lewisburg Road at signal light), 541-207-3508. As always call ahead to ensure you don’t waste a trip. – Monday through Friday, 10am to 2:00pm. Tuesday, Thursday Drills and Practice Games – 10am -2pm with coaching from 10-11am. – Sunday, noon to 3pm. – Cost: $30 for 10 plays, or $5 for each individual drop-in time. Lots of information about Corvallis Pickleball either indoors at the Timberhill Athletic Club or outdoors at the 8 court venue at Adams school on Philomath Blvd. They also have a Doodle Board for the outdoor play, weather permitting. From day 1 we have had a great relationship with the City of Albany to promote and grow pickleball. Together we selected the little used tennis court at Eleanor Hackleman Park as a suitable venue for our pickleball play with the long term goal of enhancing and renovating the court into 4 pickleball courts. 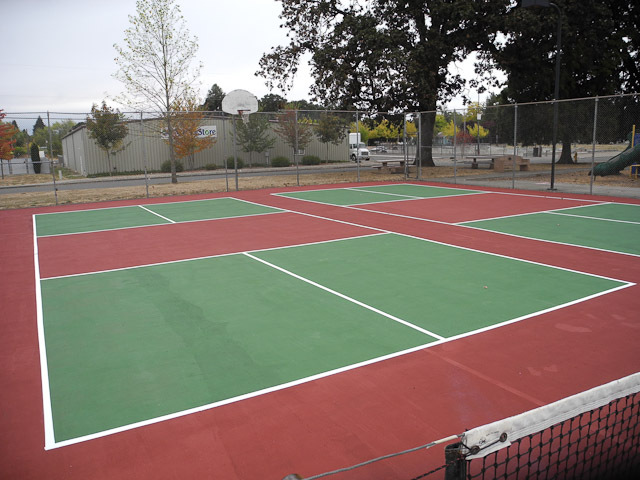 In 2012, the City invested in court patching and painting materials and members of the Club provided the “love and labor”, bought one set of posts/net and the proceeds from the Rally In The Valley tournament were used to renovate the courts. The collaboration between the City and the Club has developed 4 permanent courts in Albany that we can all be proud of. July/August, 2012: Hackleman Court Renovation Phase 1. Power washed the entire tennis court surface, patched cracks and divots, painted the south half of the court, painted lines and installed permanent nets and posts. The courts were finished just before the tournament. Court painting and first day of play on the 2 new permanent courts. 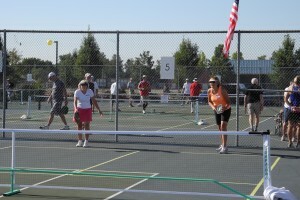 August 24-26, 2012: Our 1st Rally In The Valley Pickleball Tournament at West Albany High School. Some of the tournament play. October 2012: Hackleman Court Renovation Phase 2. Patched and resurfaced the north half of the court, painted the courts and painted lines. Permanent nets and posts, although purchased, will not be installed until spring of 2013 as we will be moving indoors soon.